The comeback, which features singer Pharrell Williams, had the biggest streaming day for a single track in the US and UK on the day of its release. Spotify's Will Hope said the album would be "the biggest" this year. "There was never any doubt that the first original single from Daft Punk in years was going to be one of the biggest debut singles of 2013," the director of label relations said. "We expect the album to become one of the biggest, if not the biggest, on Spotify this year," he added. Thrift Shop, a single by Seattle-based rapper Macklemore and producer Ryan Lewis, held the record in the US. 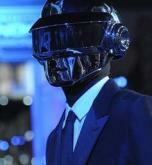 Chic guitarist Nile Rodgers features alongside Williams on Daft Punk's new disco inspired track. The duo whose real names are Thomas Bangalter and Guy De Homem-Christo, told Rolling Stone magazine they hired "top-notch session players" to perform on the album. Random Access Memories is Daft Punk's first studio album since 2005's Human After All, though the band scored the Tron: Legacy soundtrack in 2010. They won a Grammy in 2009 for their live album, Alive 2007.